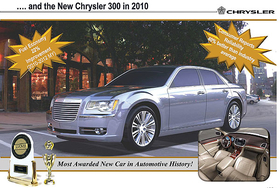 The Chrysler 300 is typical of the companys low-mpg vehicle lineup. DETROIT -- Chrysler LLC says it can survive without a proposed product-sharing alliance with Fiat S.p.A. if it gets an additional $5 billion federal loan. But analysts say Chrysler's stand-alone plan relies on extremely optimistic assumptions. In its Tuesday, Feb.17, submission to the U.S. Treasury Department, Chrysler laid out two survival plans - one with an alliance with Fiat and one without. In the stand-alone scenario, Chrysler assumes it can maintain U.S. market share, get debt reduction deals with creditors and win price cuts from suppliers. In a Feb. 17 letter to Chrysler stakeholders, CEO Bob Nardelli said: "We believe our submission meets the terms of the federal loan demonstrating our viability as a stand-alone company, as well as the potential benefits of a strategic alliance." But even if every part of the rosy scenario pans out, the smallest Detroit carmaker needs a lot more products to survive. Without Fiat, Chrysler has no small cars and a thin lineup of mid-sized cars in its future. The company has promoted its plans to produce electric cars, but low gasoline prices will make that market niche small. Kimberly Rodriguez, a former corporate turnaround specialist who now is an analyst for Grant Thornton in suburban Detroit, is skeptical of Chrysler's stand-alone plan. "It's a bit of a hang-on strategy in the hope some other thing comes their way," Rodriguez said. "They effectively agree that it's not enough." Chrysler spokesman Stuart Schorr took issue with the assertion that Chrysler's stand-alone assumptions are unrealistic. The company assumed that the auto industry would remain in recession for the next three years, Schorr noted. "Chrysler's viability plan is conservatively based and demonstrates how the company can be viable at U.S. market forecasts that are lower than even some of the most pessimistic third parties have predicted," he said. Fiat's participation would pump fresh products into Chrysler's lineup, which lacks the small and mid-sized cars Chrysler will need to meet fuel economy targets. Chrysler lists nine Fiat and Alfa Romeo vehicles, including three current vehicles and six future models, in its product plan. Said Lars Luedeman, also of Grant Thornton: If Chrysler's plan "doesn't include Fiat, how are they ever going to meet the CAFE regulations?" Without Fiat, Chrysler has little in the pipeline beyond the next-generation Jeep Grand Cherokee, Dodge Durango, Chrysler 300 and Dodge Charger - all low-mpg vehicles - due in the next two years. Chrysler is planning several electric vehicles, including plug-in hybrids and pure electrics. But the market for electric cars looks small, especially with low fuel prices. The first of several electric vehicles will arrive in 2010. But Chrysler has only one small vehicle in its stand-alone plan, a Nissan-made car to be called the Dodge Hornet. And this month Chrysler and Nissan put the Hornet on hold. Analysts say Chrysler also made over-optimistic assumptions about production capacity and supplier givebacks. GM and Chrysler have vowed to reduce manufacturing capacity to bring inventories in line with a shrinking market. But Chrysler's plan suggests it will eliminate only 100,000 units of capacity this year. That would leave a stand-alone Chrysler with considerable excess capacity. Since launching its recovery plan two years ago, Chrysler says it has eliminated 1.3 million units, or 35 percent, of production capacity. Automotive News estimates Chrysler now operates with a production capacity of 1.8 million units. But the company still is saddled with stubborn inventories of unsold vehicles. The unused capacity would be useful in a Fiat alliance but not to a stand-alone Chrysler, said John Casesa, an industry adviser with Casesa Shapiro LLC. "I was shocked they announced the plan didn't include more capacity rationalization," Casesa said. "On a stand-alone basis, Chrysler certainly doesn't need all the capacity it has. But it may make sense to keep it around for a partner." Meanwhile, Chrysler says it is negotiating with suppliers to get them to take a 3 percent price reduction by April 1. Analyst Rodriguez said that is unlikely. Many suppliers are struggling with their own cash-flow crises, she noted. "Not only are they not going to get that 3 percent, it's going to go the other way," Rodriguez said. "They have to give them money to keep the suppliers producing." Somewhat surprisingly, Chrysler's report mentioned the company's dormant proposal for a merger with GM, which was floated last fall and then dropped. The document suggested such an alliance would "create a company better positioned to compete with Toyota and other non-U.S. automakers." But a GM merger still looks like a long shot, said Rodriguez. Some observers note that Ron Bloom, an automotive adviser to President Barack Obama, negotiated a number of forced mergers in the steel industry. "A lot of people are saying ... that the GM option is back on the table," Rodriguez said. "From GM's standpoint, I'd say the answer would be no." Chrysler's viability plan highlights its financial vulnerability as a stand-alone company. For the first time, the company revealed that it had a net loss of $8 billion last year. Without a partner, the company concludes that it can do little better than break even. Chrysler predicts it will lose money in three of the next four years. The company expects to lose $1.1 billion this year before earning $600 million in 2010. Then the company predicts it will lose $600 million in 2011 and in 2012. Chrysler predicts U.S. industry sales will be less than 11 million units a year for the next three years. At that pace, the entire industry will struggle to make money. But Chrysler already has cut costs to the bone, and its long-term prospects look bleak. "If you take a look at the forecast, even though it goes out 10 years or whatever, it's kind of a breakeven proposition," says Rodriguez. "It just doesn't look good."